November is my annual crafting, making, planning for holidays month. 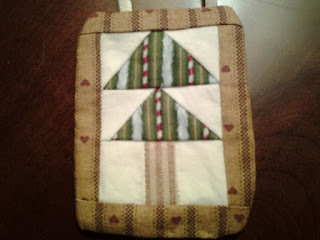 As I was putting ideas together, I saw these patchwork tree ornaments linked from Sew Mama Sew's Handmade Holidays, and thought they didn't look too difficult. Photo below: the almost-finished disastrous first attempt. If it doesn't look that awful, that's just because the photo's a bit blurred. I put that pattern aside for a week or so while I worked on other things. Then I made a second try. Sewing these ornaments made me think of several Charlotte Mason principles. 1. In many parts of life, hit-or-miss is good enough. In this case, it didn't work well. The first time around, I thought I would save time by folding rectangles in half and then snipping across (to make squares), and eyeballing the seam allowances. The second time, I cut paper patterns for each required piece, and marked the patterns with quarter-inch seam allowances as well. No more missing tree points and crooked borders. Everything lined up the way it was supposed to. Should I have been surprised? But it's not just about practicing attention and accuracy. It's about commitment to the method. 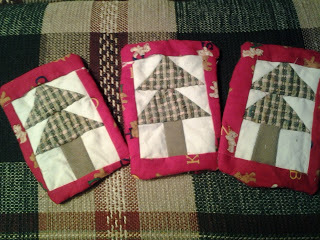 It would have been easy to say the pattern was not right or too hard, just because my first try didn't work. I didn't become that much better a sewer in one week. What made the difference? Having faith in the image that was presented, and following all the instructions. 2. Just because something's free doesn't mean it's the best choice. 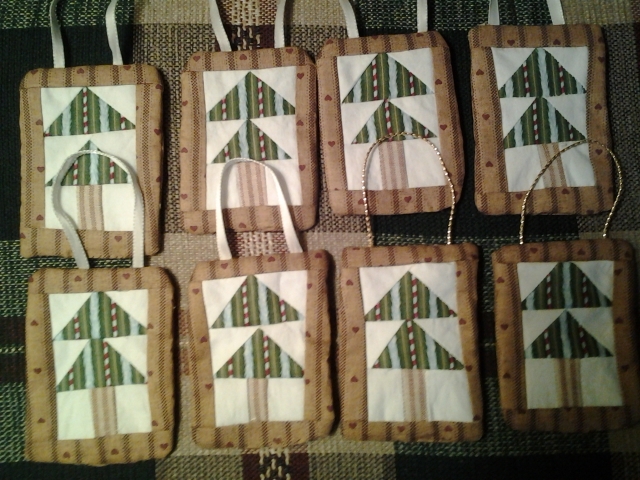 For the first ornaments, I used a scrap of red holiday-print fabric for the borders, and another green and red print for the backing fabric. (I was very limited in what I had to use, but I thought it should be red because the original was red.) The print turned out to be too scattered for the small area, and the backing fabric didn't match very well. The second time, I had been to the store and picked up a quarter-yard of brown print with tiny hearts, for both borders and backing. It looks much nicer, even though it wasn't sold as a "Christmas" fabric. 3. But it's okay to mix new and vintage materials. The white sections in both sets of ornaments are a scrap of old white percale sheet, the last remaining piece after using it for other projects over a couple of years (it was a really big sheet). I found that the percale had an interesting quirk: any holes made in the fabric, such as needle marks made in the wrong place, were very noticeable and couldn't be smoothed over. It was a strong encouragement to do it right the first time. 4. Iron, iron, iron. Kind of like narrate, narrate, narrate. Cute ornaments. I too love to see an ornament...I will photograph it....and try and make it myself. I bought two spoons at Lifeway and have tried to reproduce them. They were not as cute....but still cute in their own way.